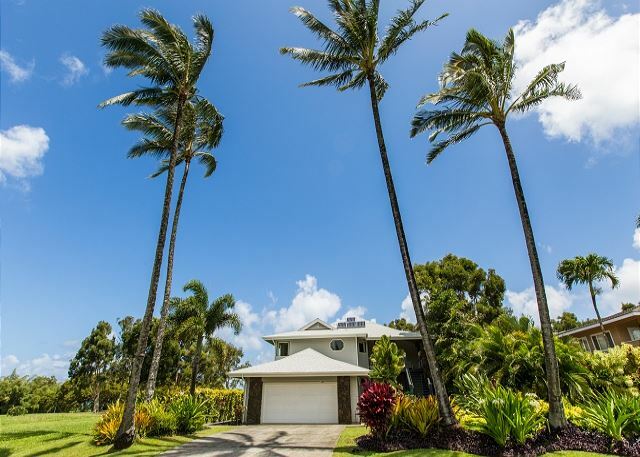 This lovely 3 bedroom, 3 bathroom home is located on the golf course in the North Shore's resort community of Princeville. Spectacular mountain views can be found all around the home and even a peek-a-boo ocean view! The 2800 sqft. 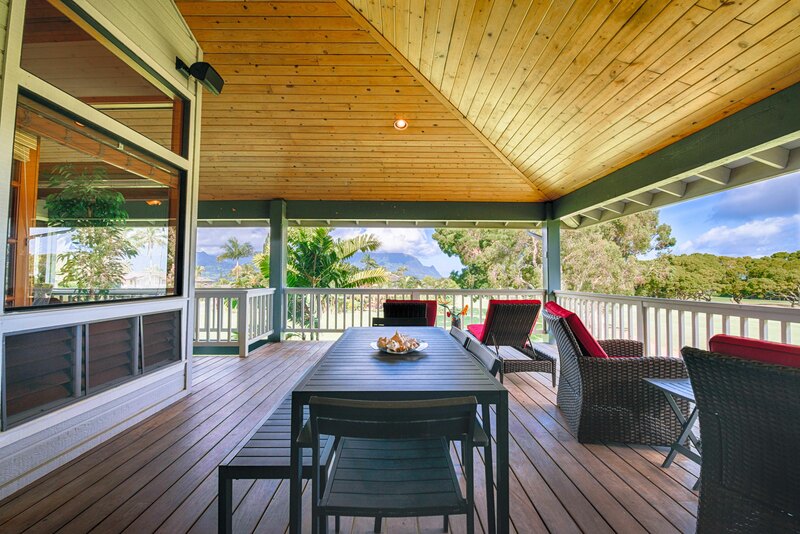 two story home offers expansive covered lanais on both levels, perfect for enjoying the scenery. This is a very close walk the St. Regis Resort and Beach, Hanalei Bay Resort and Happy Talk Lounge. 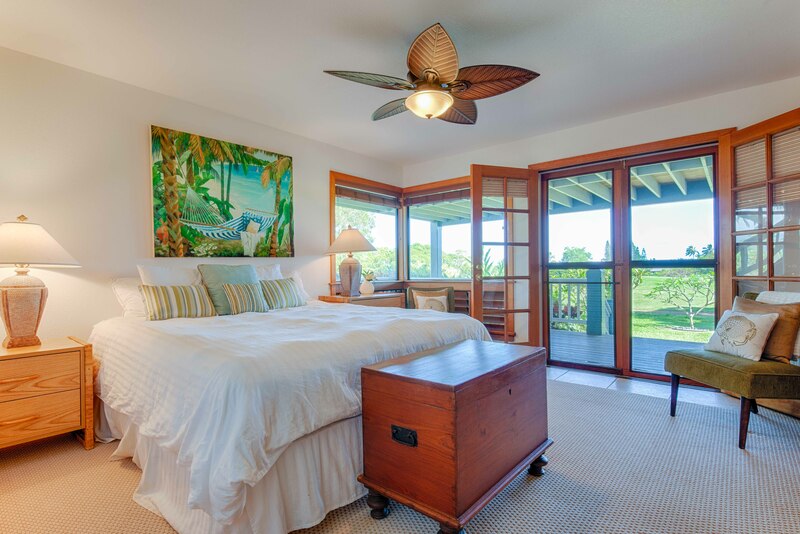 The upstairs high-vaulted ceilings and large windows cater to the cool tropical tradewinds. Covered lanai areas total 1400 sqft., providing so much outdoor living space and opportunity for epic Kauai vistas and beautiful sunset dinners! On the main floor, Bali Hai can be seen from the Living Room, Dining Room, Master Bedroom, and from a sweet loft that serves as a reading nook, or a place to watch mountain waterfalls come and go. The kitchen is fully equipped with all the essentials for preparing a great meal. There are four counter-top stools and a glass-top dining table for six. 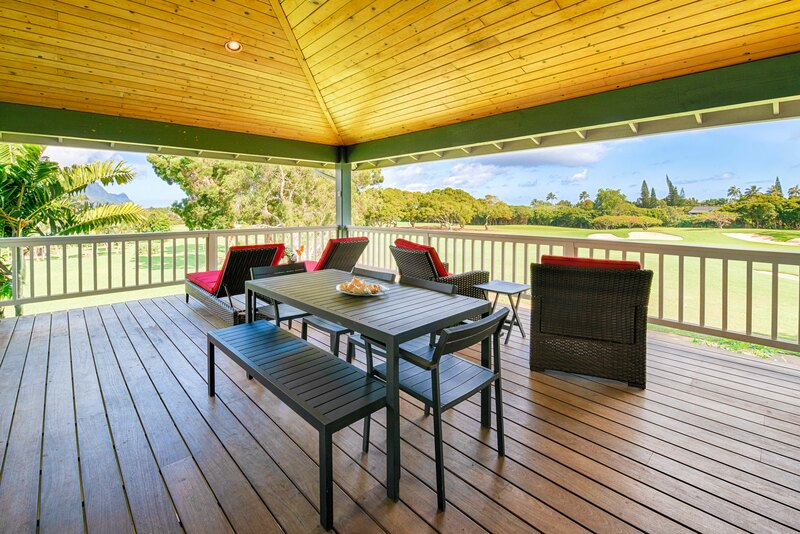 The upstairs lanai has an outdoor dining table with seating for six to seven people, where you can enjoy sweeping views of the grassy Makai Golf Course. 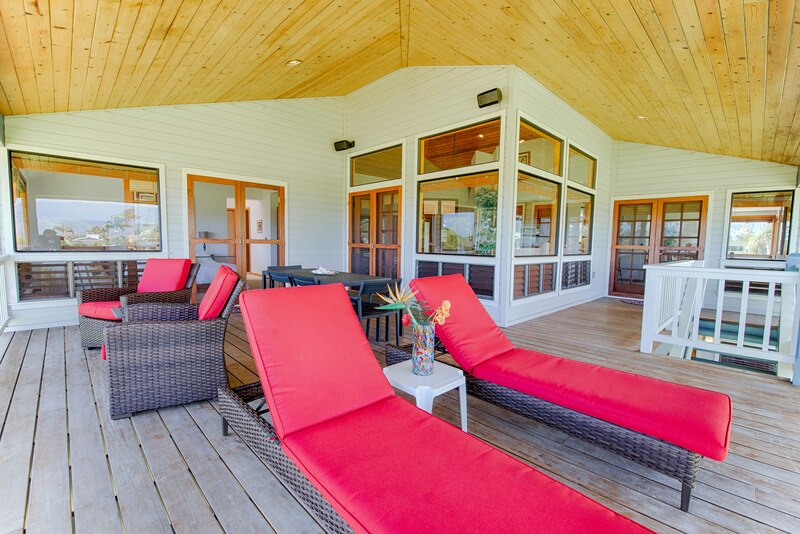 The downstairs family room has its own additional kitchenette, and just outside, a cozy porch with an outdoor grill. 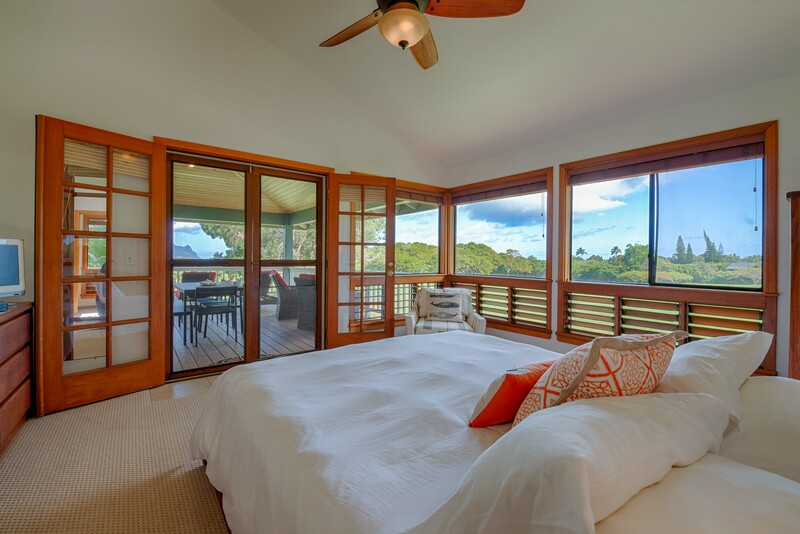 Every bedroom has glass french doors that open up to the lanais providing loungey outdoor extensions of each room! The way the house is designed, each bedroom offers a sense of private escape from the rest of the home. Of the 3 bedrooms, there are two King beds and one Queen bed. There is also an additional Queen sofa sleeper which allows the home to host up to 8 people. The master bedroom has stunning views of Bali Hai, a magical display of nature to rise to in the morning. The master bathroom has a glass enclosed walk-in shower and a separate, deep soaking tub. 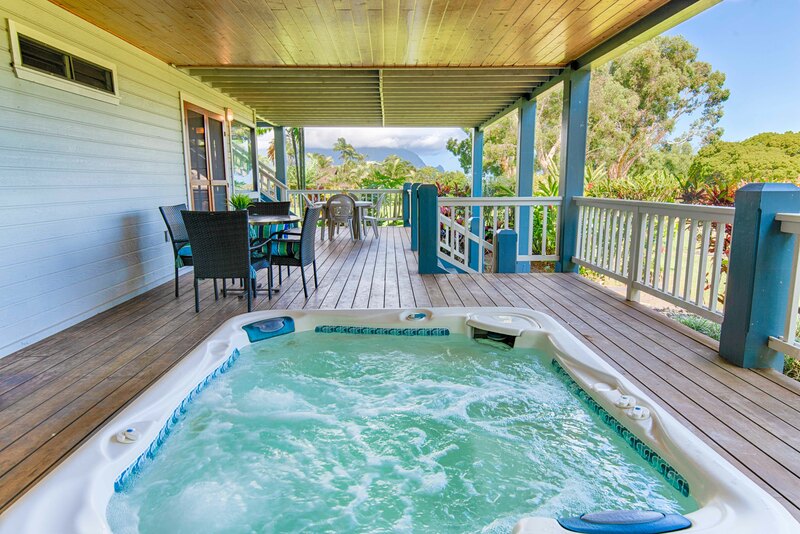 And what vacation wouldn't be complete without your own jetted hot tub, set on the private, open-air lanai! Unwind in the tub after a day at the beach, or have an after dinner drink on the lanai after you return from your walk from dinner at Happy Talk. 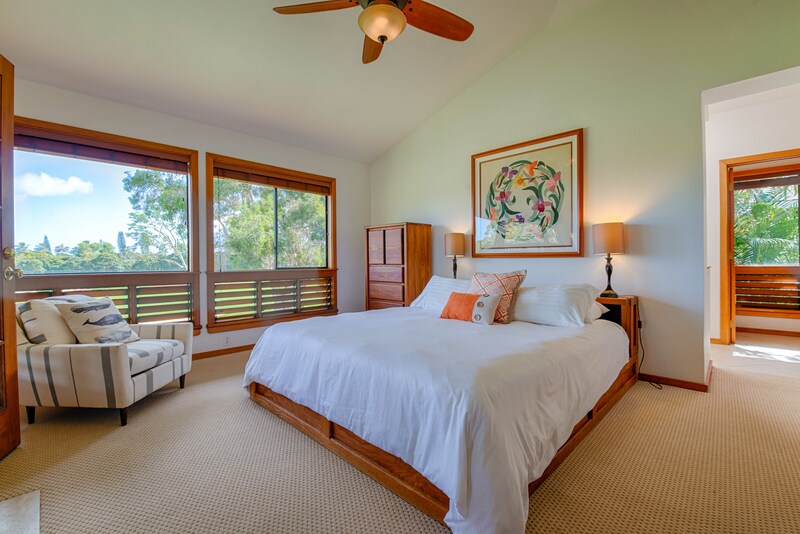 The stunning surrounding mountain views, the privacy provided by the lush tropical landscaping, and the home's ideal location that offer access to so many amenities makes Bali Hai View one of the best vacation homes on the North Shore. I am so happy to hear that you had a wonderful stay! We constantly work towards guest satisfaction . We greatly appreciate your review as well. Beautiful home. Had everything you would ever need on a trip. Great location. Very spacious and well taken care of. Would definitely stay again. We had an amazing time. The house was fantastic. We will be back. Thank you for your review! We looking forward to your next stay. This home was just as described. We were a family with 3 couples and a single and there was plenty of room for everyone. We especially loved the upper lanai, spending most of our time there. Some of the beach equipment is a bit run down and broken but a quick text to the property manager fixed most of it. A note for those who like to sleep in, the golf course maintenance crews start working around 5:30 daily, driving on the golf cart path right beside the house. This could get rather noisy some mornings as the windows are all open in the house for cooling. Seemed strange considering the bylaw for noise was quiet time between 10 pm - 8 am. A great time with not so great weather! The place was all the web site showed and said. Quite a nice place with all kinds of extras. All the beach gear and people leaving spices, extra kitchen utilities, just made it feel welcoming. Hot tub was great but only wanted to go through a few jet cycles and rest. We still enjoyed. I am so happy to hear that you had a wonderful stay! We will check out the hot tub situation thanks for letting us know. We greatly appreciate your review as well. Bali Hai View was perfect. Right on the golf course, shopping was within walking distance as was the beach and a hotel restaurant. The house came with everything and was very clean. We would definitely stay there again. I am so happy to hear that you had a wonderful stay and found it to be a convenient location! We constantly work towards guest satisfaction . We greatly appreciate your review as well. We stayed with my son and daughter in law and my Mom. There was plenty of room! The house was fully equipped with everything we needed for our stay. Because of the flooding we weren’t able to see the whole island but enjoyed what we were able to see. Hanalei Bay was just a few minutes away so we drove there several mornings to walk the beach and enjoy the sunrise. The only thing we found as an issue was the hot tub didn’t really get hot but everything else was great! We had no issues or concerns to bring to the rental agency. Everything was included in the information sent to us and provided at the house. We couldn’t have asked for a more enjoyable and relaxing vacation!! Aloha, thank you for your review and for sharing your experience with us. 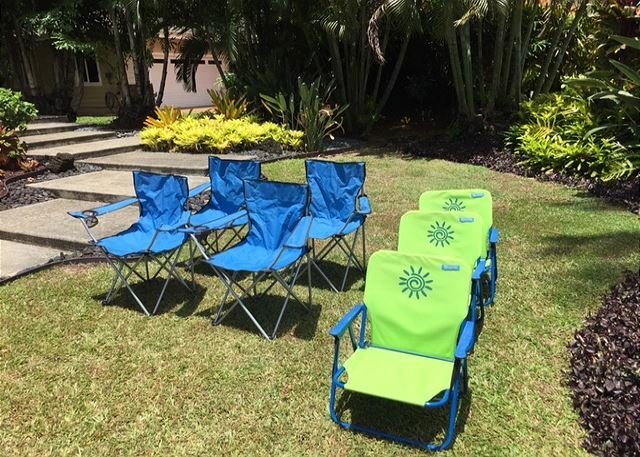 We are so thrilled to hear you had everything you needed for pleasant stay, despite the whole island not being accessible. We appreciate you sharing your experience with the hot tub and will look into this for future guests. 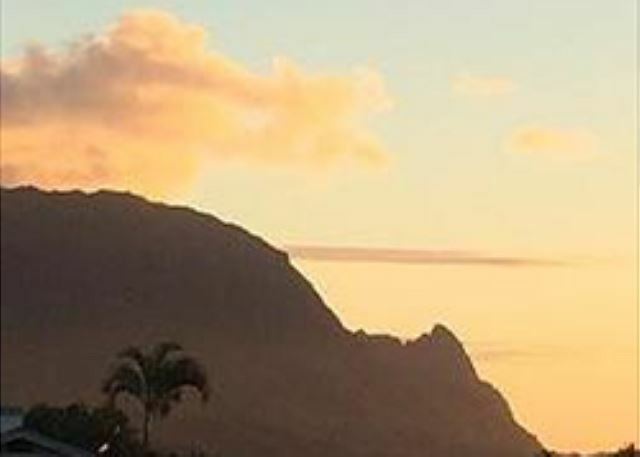 We agree, Hanalei bay is very lovely and enjoying sunrise sounds so wonderful! Mahalo for being such great guests and we look forward to seeing you again soon! This was our 10th visit to Kauai and we’ve stayed in condos and homes, but this was our favorite yet! It was so well ventilated and airy, and although there were three couples and a child, we never felt crowded. We love to cook and the kitchen was very well appointed. We would love to stay at Bali Hai Veiw again! Aloha! Thank you so much for your review and recommendation! We are so thrilled to hear you had a great experience in your home-away from home and there was space for everyone. It's wonderful to know you had everything you needed during your visit and we appreciate you being such wonderful guests! We look forward to seeing you again during your next visit. This house was clean, in a great location and enormous. We visited with only 4 people, however felt that it would be able to house 6-7 comfortably. Aloha! Thank you for your review and recommendation. It's wonderful to hear your group enjoyed their stay with us and it sounds like you had everything you needed for a pleasant experience! We agree, the location of this home is very nice to access much of the North Shore area. We hope you were able to spend a lot of time exploring as well as relaxing in your home-away from home. Mahalo for being such great guests and we look forward to seeing you again soon! We were so excited just to pull up to the house and when we got inside we were just as excited to see where we would be living for the week. The accommodations were very comfortable and the place was set up to give us a great place to live for the week! The conceirge was very easy to reach and the experience was a dream! Thanks again!! Aloha! Thank you so much for your excellent review and recommendation! We are so thrilled to hear you had everything you needed for a wonderful experience and it's great you were able to make use of out concierge services! Thank you for being such pleasant guests and we look forward to seeing you again soon. House and location was perfect for 6 adults. Hope to return. Thank you for your review. We look forward to your return visit! My family stayed here over New Years 2016. The house is beautiful and there is plenty of space for 6-8 people without it feeling cramped. The views of the golf course and Na Pali coast in the distance are beautiful. If you are planning on cooking, make sure you bring everything you could possibly need as there wasn't even salt & pepper for guests to use. However, we enjoyed our stay and would recommend this property for the location, spaciousness, and views. Lovely home on the golf course, tropical furnishings, quiet setting. 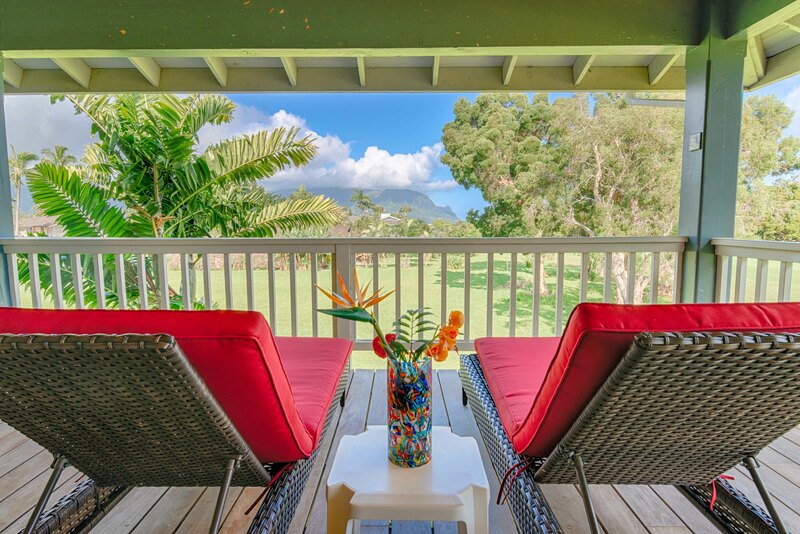 Great location in Princeville. Well stocked kitchen for our 8 day stay. We would return here for another vacation and refer our friends. Aside from the buggy hot tub, everything worked properly. The house was bigger and cleaner than we expected. 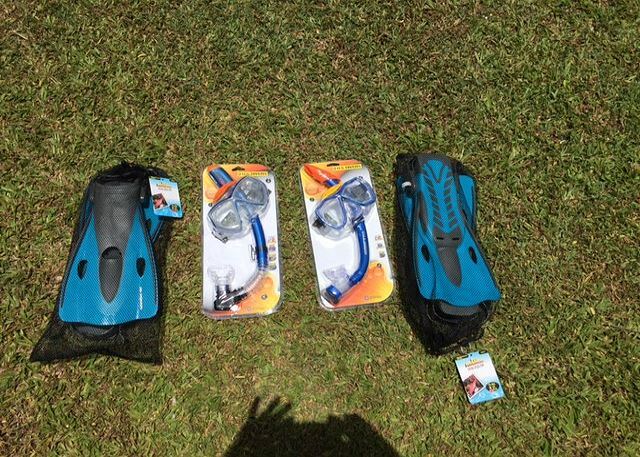 There were floats, umbrellas, etc for snorkelling. Plates and cutlery to make it like home. There is a covered lanai upstairs and downstairs! Screened vents everywhere for air circulation. Aloha Supreet! Sorry to hear about the buggy hot tub. We trust that your property manager Eric helped you to address the issue. Sounds like otherwise it was a great stay! We had a nice stay at the house. It is big, has a great view, is comfortable, and close to anything you could want. A bit of frustration with the solar water heater, which (due to continuous rain...waah waah) caused us to not have hot water for several hours at a time. Eric, the property manager, was very good about communicating with me (even on Christmas morning) about fixing it. Aloha David! Please accept our apologies regarding the water heater. We are glad to hear that Eric was available and attentive to you. Please think of us again on your next visit to Kauai! Great house. 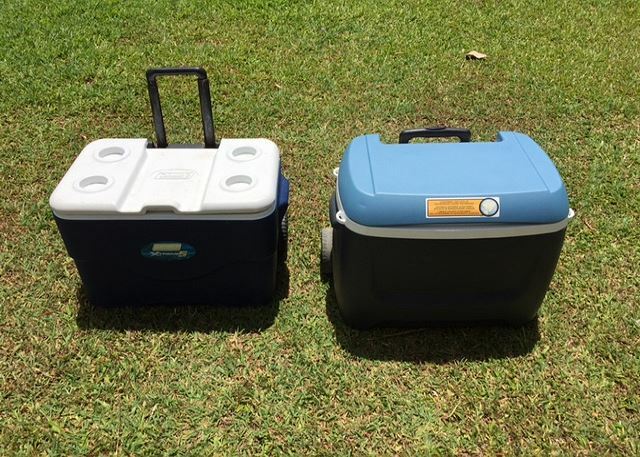 Large, well equipped (and everything worked), good location. Aloha, We are happy to hear that you enjoyed the house and everything was working well for you during your stay! Thank you for your review and recommendation, we look forward to hosting you again on your next visit to the island! Overall we very much enjoyed our stay at the home. It was clean with more beach toys and bikes than the first time we stayed there 4 years ago. The water heater was not working properly and it took about week before it was fixed properly. The remote on the TV in the living room was impossible to figure out and navigate and really needs to be simplified. However, for the most part we very much enjoyed the house and the quick response from Eric the property manager when we called him. The view from the deck is spectacular! 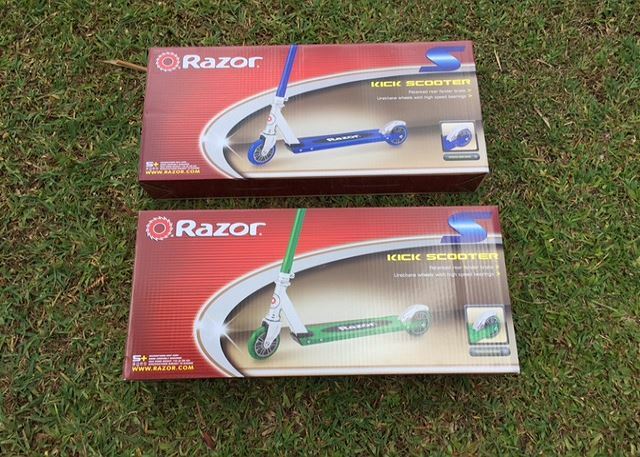 Aloha, thank you for your review and suggestions! We apologize for the issues regarding the water heater. We appreciate your patience and glad it was able to be resolved during your stay. We are happy to hear that you enjoyed your stay regardless of a few technical difficulties and glad Eric was available for your assistance. We hope you were able to make use of the beach toys and bikes and had a nice combination of fun and relaxation during your trip. Mahalo for being such respectful and pleasant guests and we look forward to seeing you again! When we arrived we were stunned with how big the house was. 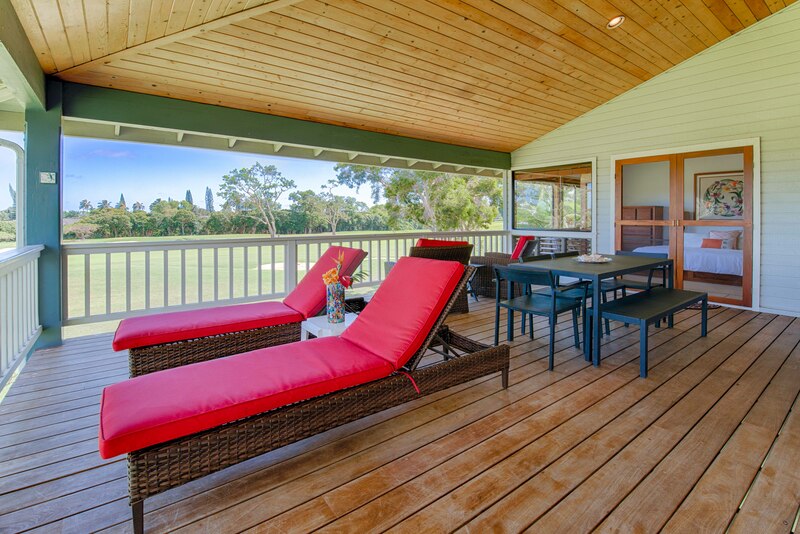 It's perfect for entertaining and having friends over for a BBQ. The rooms were large and the beds were comfortable. Plenty of extra linens, bath towels, and beach towels. Extra bonus? 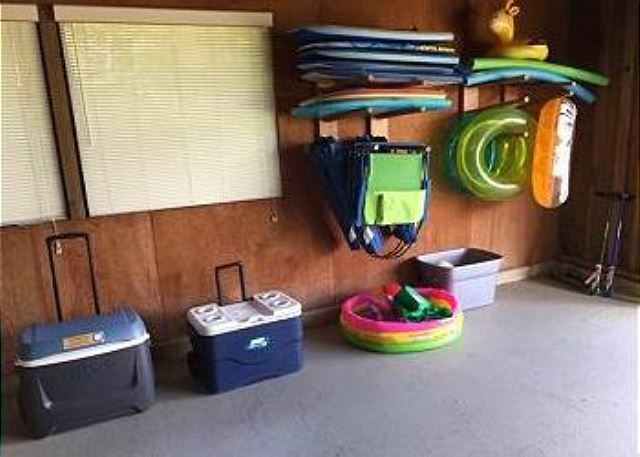 Lots of beach equipment in the garage....floaties, sand toys, boogie boards. We even left behind a couple floaties and a boogie board since we couldn't fly home with them. The kitchen has all the basics, but don't expect a ton of spices in the cupboard. Basic salt and pepper only. There was plenty of laundry detergent in the laundry room....which comes in handy when you have small kids with you! Eric, the property manager... or owner? Not sure, but he was easy to get a hold of and always responded quickly. The beach isn't within walking distance, but it's a short drive(1 mile) to the St Regis Hotel and you can use their public beach. The grocery store is only minutes away too. We would stay here again in a heart beat. Aloha! We are very happy to hear your family had an enjoyable experience with this home and were able to make use of the household items and amenities! It is excellent to hear that our property manager Eric was readily available for you and you were able to have your needs met and questions answered quickly! 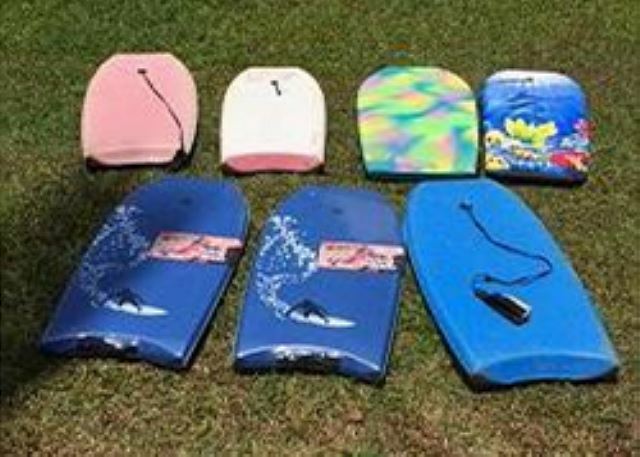 Mahalo for the addition of floaties and boogie board! We look forward to hosting you and your family again in the near future! Our family had a great time at the Bali Hai View House. Great position and layout, with great views of the mountain and golfcourse. There were some drawbacks to the house.One bedroom wardrobe door had fallen off and made the bedroom look tacky and undesirable.There were no working lights in one en suite downstairs and one ensuite toilet upstairs. There were only 8 plates, no serving plates and only 4 decent wine glasses,very under supplied and very difficult over Christmas. These problems could be easily addressed. Otherwise Bali Hai View and our stay there was very pleasant. The hot spa was a great hit. Aloha! Thank you for your review and recommendation. We are very happy to hear you had a great time and enjoyed the beautiful views. We appreciate you sharing some of the drawbacks you encountered during your stay and we will definitely take these items into consideration, but we are glad to know these inconveniences did not take away too much from your enjoyable experience. The hot spa is such a special feature, it’s great you were able to utilize some of these amenities during your stay! We hope your family was able to make some lasting memories together and we appreciate you being such wonderful guests. We hope to see you back again on your next visit! Aloha! Mahalo for the excellent review and recommendation. We appreciate you being such wonderful guests and we look forward to seeing you again soon!